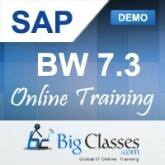 The additional rise for SAP BW 7.5 release is high in the part of data load features. Initially, there are some fresh data load options in SAP BW 7.5. Now we can create generic delta extraction for the UD (Universal Data) and DB (Database Connect) alternatively, including the flat files. We can also use the latest DataSource adapter named Web Service Pull to load the data from external web services. You can also create the generic Web Services delta loads and load the new data directly into the staging area of SAP BW 7.5. In SAP BW 7.0, all the way through activation SAP BW had to look up in the NIRV table to see that the object already survive or not. This could be a very slow process. We had some essential tools to assist us in tuning this. We could safeguard the number choice to evaluate the data load with records in-memory to pace up data activation process. However, in SAP BW 7.5 the data activation is altered from particular lookups to package fetch of the active table, ensuing in earlier activation and less locks on the lookup tables. The latest process may result in between 15-30% faster data activation. You now can also use the new SAP BW 7.5 initial load runtime options Insert only and the unique data records only to avoid all the look-ups during activation. A data transformation in SAP BW 7.4 suggests a Read from DataStore option for a quicker data look-up. In addition, the usage of navigational attributes as sources in Master data transformations lessen the overhead for lookups. United, this may guide to an extra 10-20% improvement. While the web services do not hold hierarchies up till now, there is currently an integration of hierarchies into the standard process flow such as DTPs and transformation, as well as being able to load hierarchies from flat file by a latest DataSource. An additional immense transform is that when you make use of delta loads, the first time SAP BW 7.5 mechanically describes it an init load after that it automatically toggle to delta as the InfoPackage mode. Overall, huge innovative features that can appreciably progress the data load. The blend of new activation options in SAP BW 7.5 and the delta tools may be the major reasons why we have to reflect on the improvement rather than later!